2 Broadcaster Press January 8, 2019 www.broadcasteronline.com School Lunch Menus Menus listed below are for January 9 – January 15. Menus are subject to change without notice. Vermillion Schools Breakfast Available everyday: Breakfast entrée or choice of cereals with toast. Fruit or Fruit Juice, Milk choices Wednesday – A. Pancakes with Syrup, B. Cereal Choices with Toast, Juice Choices, Fresh Apple Wedges Thursday – A. Bacon & Egg Breakfast Pizza, B. Cereal Choices with Toast, Juice Choices, Fresh Orange Slices Friday – A. Fresh Baked Cinnamon Roll, B. Cereal Choices with Toast, Juice Choices, Applesauce Monday – A. Fresh Baked Ham, Egg & Cheese Biscuit Sandwich, B. Cereal Choices with Toast, Juice Choices, Mixed Fruit Cocktail Tuesday – A. Iced Long John, B. Cereal Choices with Toast, Juice Choices, Fresh Apple Wedges Vermillion Elementary Schools Lunch Wednesday – A. Domino’s Pizza, B. Beef & Bean Burrito, Refried Beans Thursday – A. Home-style Spaghetti, B. Crispy Chicken Sandwich, Peas, Gelatin Dessert Friday – A. Traditional Sloppy Joe, B. Country Fried Steak, Mashed Potatoes with Country Gravy Monday – A. Italian Dunkers with Marinara Dipping Sauce, B. Baked Breaded Fish Sandwich, Golden Corn Tuesday – A. Ham, Egg & Cheese Biscuit Sandwich, B. Southwest Pulled Pork Nachos, Candied Carrots and Jalapenos on Fruit Vermillion Middle School Lunch Wednesday – A. Domino’s Pizza, B. Fajita Salad with Tortilla Chips, Refried Beans Thursday – A. Home-style Spaghetti, B. Crispy Chicken Sandwich, Peas, Gelatin Dessert Friday – A. Traditional Sloppy Joe, B. Fresh baked Sub Station, Mashed Potatoes with Country Gravy Monday – A. Italian Dunkers with Marinara Dipping Sauce, B. Cheeseburger, Golden Corn Tuesday – A. Southwest Pulled Pork Nachos, B. Fresh Baked Pepperoni Pizza Vermillion High School Lunch Wednesday – A. Country Fried Steak with Dinner Roll, B. Fresh Baked Buffalo Ranch Pizza, Mashed Potatoes with Country Gravy Thursday – A. Home-style Spaghetti with Garlic Breadstick, B. Taco Salad with Tortilla Chips, Peas, Gelatin Dessert Friday – A. Domino’s Pizza, B. Beef & Bean Burrito, Refried Beans Monday – A. Italian Dunkers with Marinara Dipping Sauce, B. Oven-Roasted Hot Dog, Golden Corn Tuesday – A. Ham, Egg & Cheese Biscuit Sandwich, B. Fruit, Yogurt & Cheese Platter, Candied Carrots and Jalapenos on Fruit St.Agnes School Lunch Wednesday – A. Domino’s Pizza, B. Beef & Bean Burrito, Refried Beans Thursday – A. Home-style Spaghetti, B. Crispy Chicken Sandwich, Peas, Gelatin Dessert Friday – A. Country Fried Steak, B. Traditional Sloppy Joe, Mashed Potatoes with Country Gravy Monday – A. Italian Dunkers with Marinara Dipping Sauce, B. Baked Breaded Fish Sandwich, Colden Corn Tuesday – A. Ham, Egg & Cheese Biscuit Sandwich, B. Southwest Pulled Pork Nachos, Candied Carrots and Jalapenos on Fruit Elk Point-Jefferson Breakfast Wednesday – A. Fresh Baked Biscuits and Gravy, B. Cereal Choices with Toast, Juice Choices, Fresh Apple Wedges Thursday – A. Bacon & Egg Breakfast Pizza, B. Cereal Choices with Toast, Juice Choices, Fresh Orange Slices Friday – A. Fresh Baked Cinnamon Roll, B. Cereal Choices with Toast, Juice Choices, Applesauce Monday – A. Fresh Baked Ham, Egg & Cheese Biscuit Sandwich, B. Cereal Choices with Toast, Juice Choices, Mixed Fruit Cocktail Tuesday – A. Iced Long John, B. Cereal Choices with Toast, Juice Choices, Fresh Apple Wedges Bosco Sticks with Marinara Dipping Sauce, B. OverRoasted Hot Dog, Steamed Carrots Tuesday – A. Super Nachos, B. Crispy Chicken Sandwich, Refried Beans, Fresh Baked Cinnamon Stick Monday – A. Glazed Donut, B. Cereal Choices with Toast, Milk Choices, Juice Choices Tuesday – A. Breakfast Sliders, B. Cereal Choices with Toast, Milk Choices, Juice Choices Elk Point-Jefferson Elementary School Lunch Wednesday – A. Homestyle Chicken & Noodles, B. Country Fried Steak, Mashed Potatoes with Country Gravy Thursday – A. Home-style Spaghetti, B. Crispy Chicken Sandwich, Peas, Gelatin Dessert Friday – A. Beef & Bean Burrito, B. Cheese Pizza, Refried Beans Monday – A. Mozzarella Bosco Sticks with Marinara Dipping Sauce, B. OverRoasted Hot Dog, Steamed Carrots Tuesday – A. Super Nachos, B. Crispy Chicken Sandwich, Refried Beans, Fresh Baked Cinnamon Stick Elk Point-Jefferson High School Lunch Wednesday – A. Home-style Chicken & Noodles with Dinner Roll, B. Country Fried Steak with Dinner Roll, Mashed Potatoes with Country Gravy Thursday – A. Home-style Spaghetti with Garlic Breadstick, B. Spicy Chicken Sandwich, Peas, Gelatin Dessert Friday – A. Beef & Bean Burrito, B. 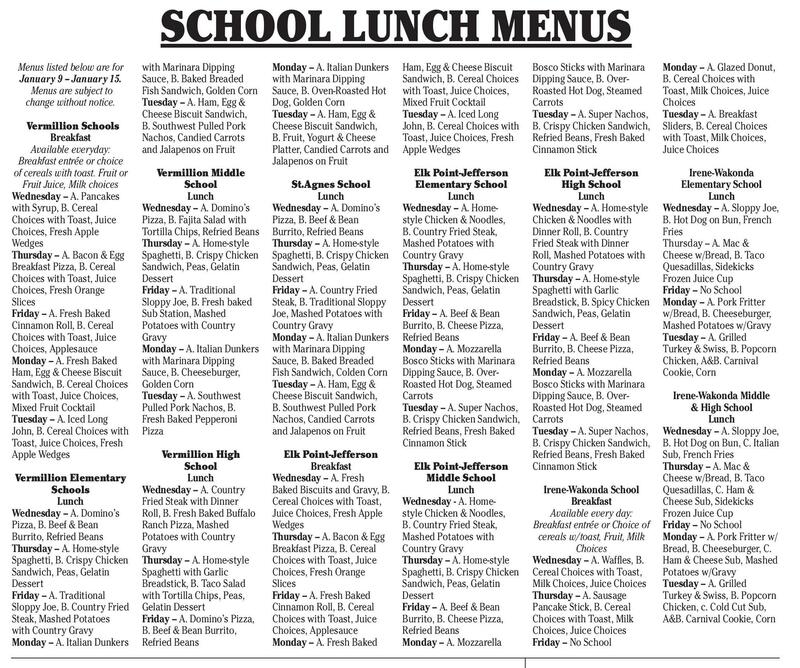 Cheese Pizza, Refried Beans Monday – A. Mozzarella Bosco Sticks with Marinara Dipping Sauce, B. OverRoasted Hot Dog, Steamed Carrots Tuesday – A. Super Nachos, B. Crispy Chicken Sandwich, Refried Beans, Fresh Baked Cinnamon Stick Irene-Wakonda Elementary School Lunch Wednesday – A. Sloppy Joe, B. Hot Dog on Bun, French Fries Thursday – A. Mac & Cheese w/Bread, B. Taco Quesadillas, Sidekicks Frozen Juice Cup Friday – No School Monday – A. Pork Fritter w/Bread, B. Cheeseburger, Mashed Potatoes w/Gravy Tuesday – A. Grilled Turkey & Swiss, B. Popcorn Chicken, A&B. Carnival Cookie, Corn Elk Point-Jefferson Middle School Lunch Wednesday - A. Homestyle Chicken & Noodles, B. Country Fried Steak, Mashed Potatoes with Country Gravy Thursday – A. Home-style Spaghetti, B. Crispy Chicken Sandwich, Peas, Gelatin Dessert Friday – A. Beef & Bean Burrito, B. Cheese Pizza, Refried Beans Monday – A. Mozzarella Dakota Senior Meals Served at The Main Street Center & Town Square, “Meals on Wheels”. Please call before 9:00am to schedule or cancel a meal at 624-7868. Menus listed below are January 9th – January 15th. Menus are subject to change without notice. All menus are served with whole grain bread and 1% milk unless otherwise noted. Dave Says Wednesday – Pork Loin Roast, Baked Potato, Peas, Fruit Cocktail	Thursday – Pork Loin Roast, Baked Potato, Peas, Fruit Cocktail Friday – Beef Barley Soup, Turkey Sandwich, Fresh Fruit Monday – Spaghetti w/Meat Sauce, Tossed Salad, Carrots, Fruit Tuesday – Pork Chops, Scalloped Potatoes, Cooked Apples, Green Beans Worried About Mom Dear Dave, My mom is 75, and I’m the executor of her estate. She has $500,000 in retirement accounts, and the only debt she has is around $70,000 on her mortgage. Most of her money is in the stock market, with only $20,000 in a money market account, and this worries me. She lives well within her means, so am I wrong to be concerned? Also, do you think she should go ahead and pay off her mortgage? 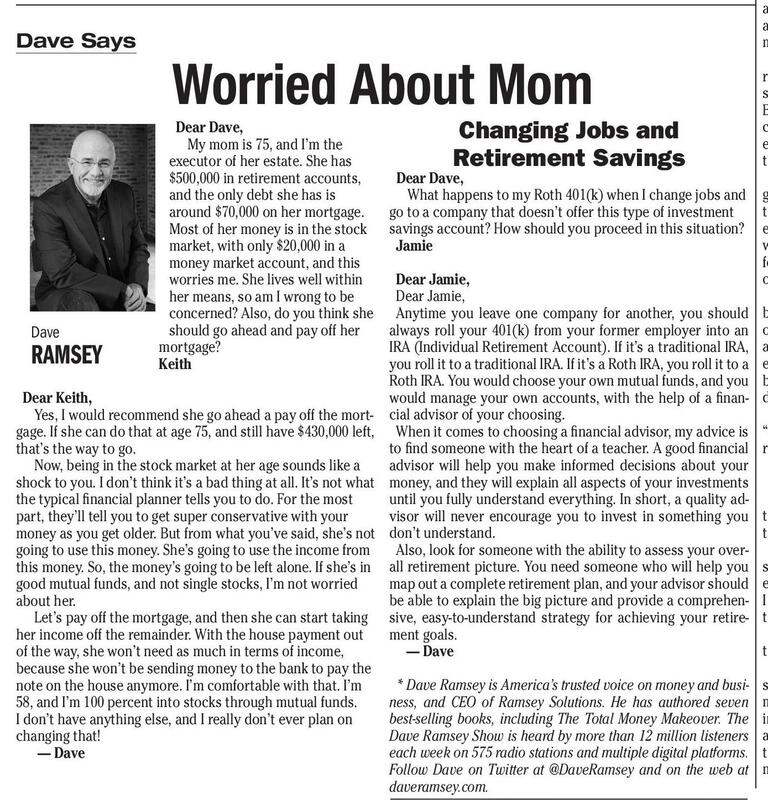 Keith Changing Jobs and Retirement Savings Dear Dave, What happens to my Roth 401(k) when I change jobs and go to a company that doesn’t offer this type of investment savings account? How should you proceed in this situation? Jamie Dear Jamie, Dear Jamie, Anytime you leave one company for another, you should always roll your 401(k) from your former employer into an Dave IRA (Individual Retirement Account). If it’s a traditional IRA, you roll it to a traditional IRA. If it’s a Roth IRA, you roll it to a Roth IRA. You would choose your own mutual funds, and you would manage your own accounts, with the help of a finanDear Keith, Yes, I would recommend she go ahead a pay off the mort- cial advisor of your choosing. gage. If she can do that at age 75, and still have $430,000 left, When it comes to choosing a financial advisor, my advice is to find someone with the heart of a teacher. A good financial that’s the way to go. advisor will help you make informed decisions about your Now, being in the stock market at her age sounds like a shock to you. I don’t think it’s a bad thing at all. It’s not what money, and they will explain all aspects of your investments until you fully understand everything. In short, a quality adthe typical financial planner tells you to do. For the most visor will never encourage you to invest in something you part, they’ll tell you to get super conservative with your money as you get older. But from what you’ve said, she’s not don’t understand. 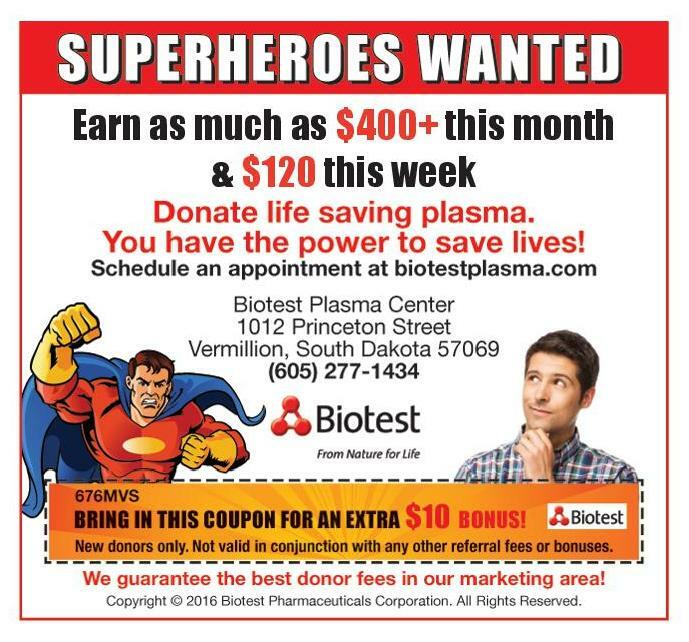 Also, look for someone with the ability to assess your overgoing to use this money. She’s going to use the income from this money. So, the money’s going to be left alone. If she’s in all retirement picture. You need someone who will help you map out a complete retirement plan, and your advisor should good mutual funds, and not single stocks, I’m not worried be able to explain the big picture and provide a comprehenabout her. Let’s pay off the mortgage, and then she can start taking sive, easy-to-understand strategy for achieving your retirement goals. her income off the remainder. With the house payment out — Dave of the way, she won’t need as much in terms of income, because she won’t be sending money to the bank to pay the * Dave Ramsey is America’s trusted voice on money and businote on the house anymore. I’m comfortable with that. I’m ness, and CEO of Ramsey Solutions. He has authored seven 58, and I’m 100 percent into stocks through mutual funds. best-selling books, including The Total Money Makeover. The I don’t have anything else, and I really don’t ever plan on Dave Ramsey Show is heard by more than 12 million listeners changing that! each week on 575 radio stations and multiple digital platforms. — Dave Follow Dave on Twitter at @DaveRamsey and on the web at daveramsey.com. Ramsey Earn as much as $400+ this month & $120 this week If you don’t get the word out about your business, no one else will!!! 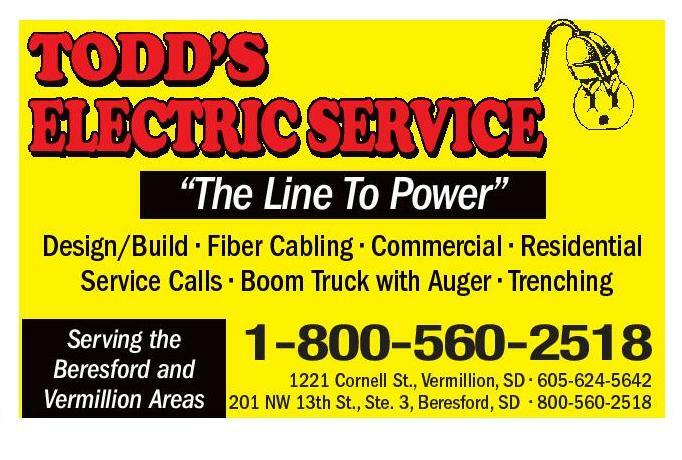 TODD’S ELECTRIC SERVICE “The Line To Power” Design/Build • Fiber Cabling • Commercial • Residential Service Calls • Boom Truck with Auger • Trenching Serving the Beresford and Vermillion Areas 1-800-560-2518 1221 Cornell St., Vermillion, SD • 605-624-5642 201 NW 13th St., Ste. 3, Beresford, SD • 800-560-2518 Irene-Wakonda School Breakfast Available every day: Breakfast entrée or Choice of cereals w/toast, Fruit, Milk Choices Wednesday – A. Waffles, B. Cereal Choices with Toast, Milk Choices, Juice Choices Thursday – A. Sausage Pancake Stick, B. Cereal Choices with Toast, Milk Choices, Juice Choices Friday – No School Irene-Wakonda Middle & High School Lunch Wednesday – A. Sloppy Joe, B. Hot Dog on Bun, C. Italian Sub, French Fries Thursday – A. Mac & Cheese w/Bread, B. Taco Quesadillas, C. Ham & Cheese Sub, Sidekicks Frozen Juice Cup Friday – No School Monday – A. Pork Fritter w/ Bread, B. Cheeseburger, C. Ham & Cheese Sub, Mashed Potatoes w/Gravy Tuesday – A. Grilled Turkey & Swiss, B. Popcorn Chicken, c. Cold Cut Sub, A&B. Carnival Cookie, Corn New Year Commitments By Daris Howard Even though it had been a few years since I had been a scoutmaster, I always tried to go on campouts with the boys when an extra adult was needed. This mostly fell on the high adventure in the summer, which lasted most of a week. Each year, as we hiked miles into the wilderness or attempted steep mountain terrain, I felt the challenge of my age a little more. And each time, I made a mental commitment to get into better shape. I missed a couple of years of high adventure due to other responsibilities, and when I was able to go again, there were some new scouts. We were camping at the base of Mount Borah, the highest peak in Idaho, facing the challenge of climbing it the next day. We had just finished dinner for the evening when one of the younger boys, Jason, mentioned that he wanted to play a game of old sow. For those of you who have never played old sow, it’s a game with about six to eight players, a hockey puck, clubs to pound the hockey puck, and everyone against everyone else. I doubt I need to say how this type of game plays out with a group of rambunctious boys, but I will mention that few ever go away from the game without a nice collection of bruises. Jason started getting the game together, and a few of the boys his age agreed to play. But he really needed at least one more player. He went to all of the older boys first, and all of them turned him down. He then started at the youngest leaders and worked his way up. I was the oldest leader by a good ten years, so after all of the others had turned him down, I was the last one for him to ask. He approached me with skepticism that I would accept. “Daris,” he said, “I know you’re old and out of shape, but we really need someone to play old sow with us.” He had me at the “old and out of shape” line. “Get me a stick,” I growled, “and prepare for a whippin’.” He excitedly ran back to the other boys and told them the news. They quickly found me a big club, and after I whittled it somewhat smooth, we were in business. I might have been old and out of shape, but I had played some tough games of old sow. The boys soon learned that experience could make up for an overabundance of energy. I blocked their sticks and moved the puck with great expertise. “Wow!” Jason said, “I’ve never seen anybody play like that.” By the time the game was over, I had earned their respect, even though I was gasping for air. I determined once more to get into better shape. The hike the next day only increased that resolve. Still, by the time the new year rolled around, I hadn’t started an exercise routine. However, the thought of the high adventure only six months away made me recommit. The days went by, and work and other challenges took priority. Before I knew it, we were on a high adventure again. This time I was the scoutmaster. Our camp was at Bear Lake with lots of water activities. One of them included carrying our big paddle boards down the mountainside, spending a day on the lake, then carrying the paddle boards back up to the waiting trailer. We carried the boards down in groups, two on each board, making multiple trips. But we spent a long time on the lake, and it was past time to set up camp. As the boys started struggling up the mountain, two carrying a paddle board, I decided we needed to hurry things up. I threw one on my shoulder and carried it up by myself. I even passed the boys. But when they finally caught up to me at the top, I was still struggling to catch my breath. Jason looked at me and said, “You know, inside all of that old fatness, you’re actually pretty strong.” And that was when I made a renewed commitment to get into shape again. And I still plan to make that my new year’s commitment—right after I finish off the last of the Christmas pie so it won’t go to waste.